Canon 514XL. You can still clearly see and focus on what you're shooting. Doesn't affect picture quality. I'd consider it a very minor issue. Iris and iris lock work properly. Electronic zoom works ( Note, on this model, zoom will only work when shutter trigger is pressed). Because it protruded from the side, a special winding crank was included to clear the counter. 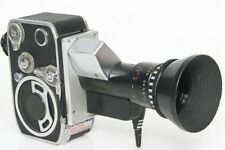 Palliard Bolex H-16. Spring cannot be over-wound. THREADING: Automatic threading and loop forming. The end of the film is simply placed in a channel leading to the feed sprocket. This particular example has the original case, eye cup, lense protector cup, overview manual / warranty card with handwritten translations of all the features! Kodak Cine Ektar Lens 15 mm f/2.5. - Kodak Anastigma Lens 25 mm f/1.9. Since then it has been sitting on a shelf in my office. I tested the motor, features and everything is still functional and in great condition. Also the handle is stuck in the closed position. (see photos). Condition is Used and UNTESTED with batteries or film for function. Rubber eyecup and rubber lens hood are a little bent but should work back into shape easily. Great Super Clean ELMO 612 S-XL Super 8 Movie Camera Sharp Lens Case MINT. Come as shown thank you for your interest Shipped with USPS Priority Mail. We tested it and it does not run. it is in good condition with age appropriate wear per the pictures shown. If you want to display model, here it is. One of the original models from 1923 with the crank built in. Serial Number 47455. With hood, Canon case, 3 58mm macro lenses in execellent condition. Original Canon case. Canon 514 XL-S is an excellent design by Canon. Not too heavy, well balanced in the hand, with a sharp lens and ultra clear viewfinder. The Automatic zooming also works perfectly. With the Canon 310xl and 514xl models you have to press the trigger before you can. Includes original box and manual as seen in pics. 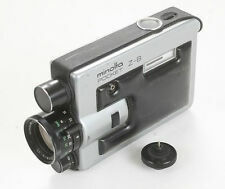 This auction is for a MINOLTA XL- SOUND 42- Super 8. MOVIE CAMERA. Tested and in good working condition. No mic attachment. *I have a .42x kenko wide angle lens attachment that screws on to the lens. If I find it by the time this camera sells I will include it at no extra charge. Lenses Clear. Complete with Three Lenses. Canon AUTO ZOOM 814 ELECTRONIC Film Movie. Macro Shooting Close distance shooting by turning the zoom ring to “Macro.”. Close-up shooting at 16.5 cm from the film plane mark is possible when the focusing ring is set at infinity. This is complete with the original Taylor Hobsen Cooke Cinema 3.5 lens. The shutter works fine and the lens is clear. Serial Number: 39944. 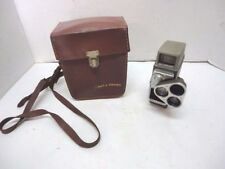 Vintage 1940s REVERE 8 Model 44 Magazine Movie Turret Camera with Case. Camera has not been tested. Gossen sixtomat color finder included. Appears to work but not tested. Owners instruction manual included and in good condition. Original Leather case is broken at top hinge but included as it fits camera perfectly and will protect it, see photos. SOLD AS IS. Message with any questions please. Shipped with USPS Priority Mail. We promise to resolve your concerns quickly and professionally. Includes original box. Requires 4x AA batteries (not included). What you see is what you get. Proceeds are used to support local programs and services. 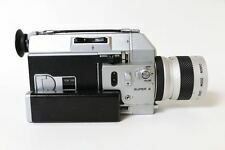 Beaulieu 4008ZM Super 8 with Angenieux 8-64mm F1.9 zoom lens. Camera is in good working order, cosmetics are also good showing some wear to the exterior. Lens is in good physical shape, glass is clean and clear, auto exposure works well, power zoom works but a bit noisy, external battery works well and holds a good charge. Comes in original case which shows some wear inside, charger for external battery, and a filter that’s in ok shape but mostly included to protect the front lens elements. With this camera you can start shooting right away! Please ask any questions before bidding!!!! I respond quickly!!!! Happy to combine shipping!!!!! Please check my other items!!!! Kodak Cine Special accessory hand crank winder for the 100' magazine.Note the offset drive pins that fit perfectly over the driven plate with holes in the magazine. Not sure what its purpose is nor even if it was made by Kodak as we can't find any reference to it in any of the instruction manuals we've downloaded or an internet search. It is the special-order ostrich skin model. The leather body shows heavy wear but the leather is intact.The outer case is in poor condition with splitting on the top cover edges, and the handle and strap are both missing. It winds and shoots but that is the limit to testing. 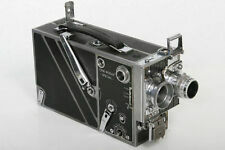 Keystone K26 Rollfilm Movie Camera. Shipped with USPS Priority Mail. The camera is an estate sale purchase. It looks to be in pristine condition. The camera is sold as is.